Caye Caulker | Which is better: to fly or take the water taxi? Caye Caulker | Should I fly or take the water taxi? 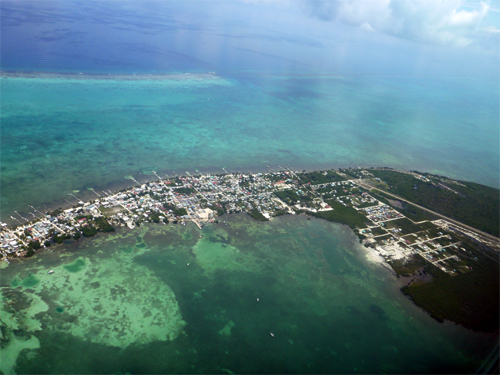 Caye Caulker is a popular island for tourism in Belize. It’s kind of funky and fun, and has a lot of hotels, restaurants, and bars. It is right on the Belize Barrier Reef and gets a lot of traffic from the younger set. It is about 20-25 miles from Belize City, and is easy to get to. Sometimes our guests want to go there for a couple of days before or after their adventure island trip with us, so I do get this question periodically. If you are doing the Caye Caulker trip before our island adventure, and planning to visit Caye Caulker as soon as you arrive in the country, I would recommend flying to Caye Caulker, not taking the water taxi. You could return on the taxi, but at the beginning it makes more sense to fly. The reason is you fly into an airport, so you are right there to catch a flight, and it is so much faster. It IS somewhat cheaper to take the water taxi, so if your budget is a concern, you might not wish to take my advice. Water taxi: cab to dock, approx 20 minutes, wait for boat departure, approx 20 minutes, taxi time: approx 45 minutes, total 1 hour 15 minutes. ← Blue Hole Belize | Can I dive it from Glovers Reef?